British Gas is a leading energy and home services provider in the United Kingdom. It is a trading name of British Gas Services Limited and British Gas New Heating Limited and is a subsidiary of Centrica. 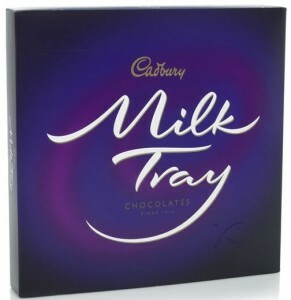 Milk Tray is brand of boxed chocolates currently manufactured by Cadbury. Introduced by Cadbury UK in 1915, it is one of the longest running brands in the confectioner’s portfolio. Milk Tray is sold in Australia, parts of Canada (such as Newfoundland), Ireland, New Zealand, South Africa and the United Kingdom. The name ‘Tray’ derived from the way in which the original assortment was delivered to the shops. Originally Milk Tray was packed in five and a half pound boxes, arranged on trays from which it was sold loose to customers. In 1916 a half pound deep-lidded box was introduced with a purple background and gold script, which has undergone minor changes in the ninety years since it was introduced. In 1924 a one-pound box was introduced, and by the mid 1930s the Cadbury’s Milk Tray assortment was outselling all its competitors. The pack design has been regularly updated and the assortment itself has changed in line with consumer preferences, and today it is still one of the most popular boxes of chocolates in the UK selling over 8 million boxes per annum. St Ivel is a brand of dairy products in the United Kingdom. It began as a subsidiary under the ownership of the Unigate dairy company with most production sites in the south west of England and some in Wales. Most of its brands were bought in the early 2000s by Dairy Crest following a severe decline in doorstep deliveries of milk – previously a major area of business for owners Unigate. The Anglia Building Society in the United Kingdom was originally formed by the merger of the Northampton Town and County and Leicestershire building societies in 1966. In 1987, it merged with Nationwide Building Society, becoming Nationwide Anglia Building Society before reverting to the Nationwide name in 1992. Cadbury is a confectionery company owned by Kraft Foods and is the industry’s second-largest globally after Mars, Incorporated. With its headquarters inUxbridge, London, United Kingdom, the company operates in more than 50 countries worldwide. The company was known as Cadbury Schweppes plc from 1969–2008 until its demerger, in which its global confectionery business was separated from its US beverage unit (now called “Dr Pepper Snapple Group”). It was also a constant constituent of the FTSE 100 from the index’s 1984 inception until its 2010 Kraft Foods takeover.